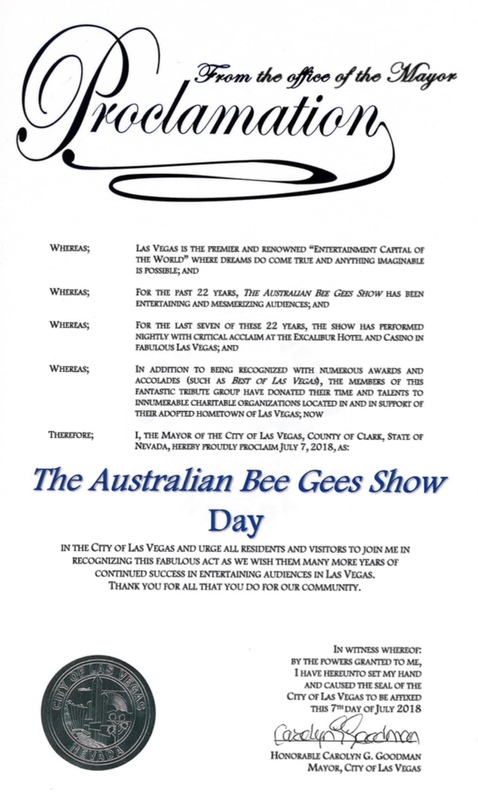 Saturday, July 7th, 2018, will now be known as The Australian Bee Gees Show Day in the City of Las Vegas. Mayor Carolyn Goodman, bestowed the honor on this long running Tribute to The Bee Gees in her chambers at Las Vegas City Hall on Monday Afternoon, July 2nd. Surrounded by the groups family and friends, the Proclamation was presented to Michael Clift (Barry), Wayne Hosking (Maurice), David Scott (Robin) and Tony Richards (Bassist), the founding members of the group. They have been continuously performing for past 22 years. The Australian Bee Gees Show has been in residence at Excalibur Hotel & Casino since February 2011. Excalibur’s Entertainment Director, Joel Seidman, was among the honored guests. The Anniversary Week of Celebrations will culminate in a 22nd Disco Anniversary Party with The Australian Bee Gees Show on Saturday, July 7th at 5:00pm, inside the Thunder From Down Under Showroom at Excalibur Hotel & Casino.